This Nor'easter treated us folks in Snyder County to a little slush and rain. No real snow, ice or wind. But my wife felt nervous about driving to her chiropractor app't so I drove her there and went to see my mistress. Didn't have any boots or rain gear but in about 30 minutes I had 5 smallies....Oh boy!! So after lunch I returned to Susky-Q and picked up 7 more smallies, a nice walleye and someone's lost goldfish. 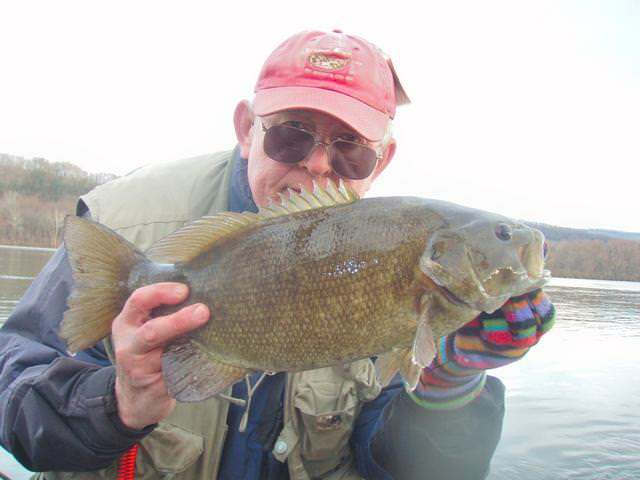 Half the smallies were 2.5-3 pounds and three of them were over 3 pounds. Nice winter fish. Right now we could stand to see some stable water temperatures around 38-40F and we might have a good cold water bite. 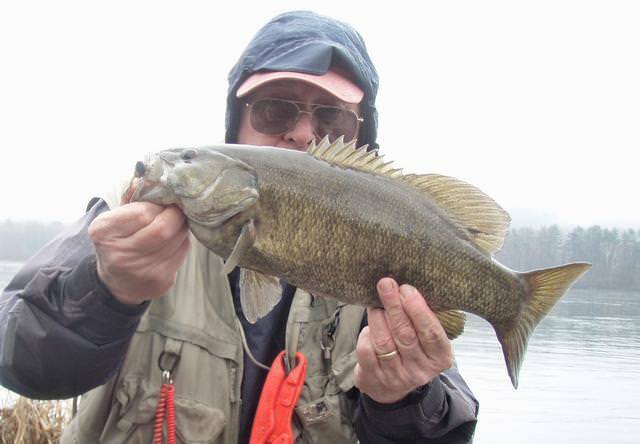 I racked up another 9 smallies on the Baby Predator Craw and its diminutive cousin the Willie Wanabee. Among the takers was this beautiful 4 lb 4 oz. specimen. Forecast daytime temps don't look too bad but nights will be dipping below freezing. Might be a problem for the smallmouth. We shall see. I love all the signs of spring also. The seagulls are coming up from the bay and feeding on nymphs in the water. Last time I was out I noticed a number of black stone fly nymphs coming off the water. But smallmouth don't see the budding trees, the snow geese and the gulls (although they probably feed on the stone fly nymphs). Being cold blooded...their body temp stays pretty close to the water temp and that is the problem during this pre-spring time of the year. The only temperature gauge I know of is Danville. The Danville temp is jostling back and forth between 37-38F. Daytime temps get up into the 40's but night temps are below freeezing. At 40F or below the bass are not going to be real aggressive. 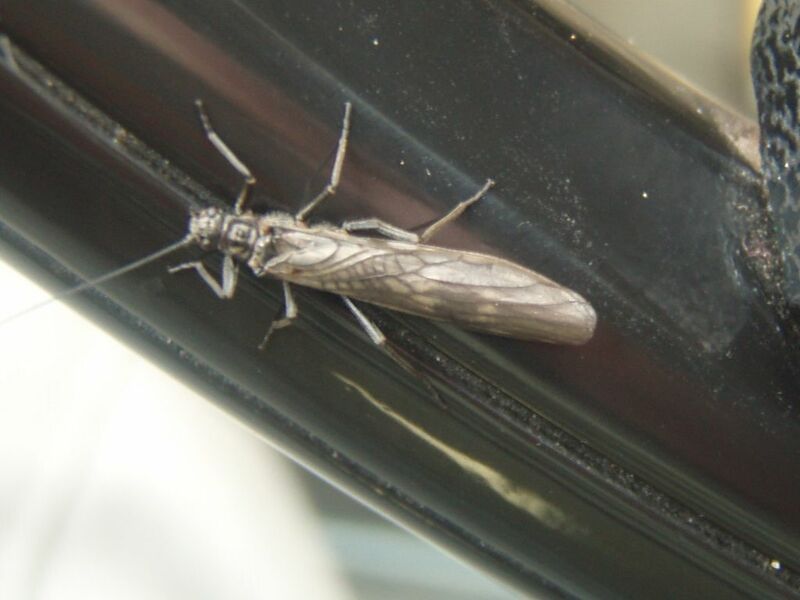 They're not going to be cruising around in the faster currents looking for food. Their metabolism is till slow and they are not being driven to spawn yet or eat very much. So I believe the key for the guy who wades the shoreline is to find quiet pools and eddies and to use smaller baits that are easy to catch and eat. 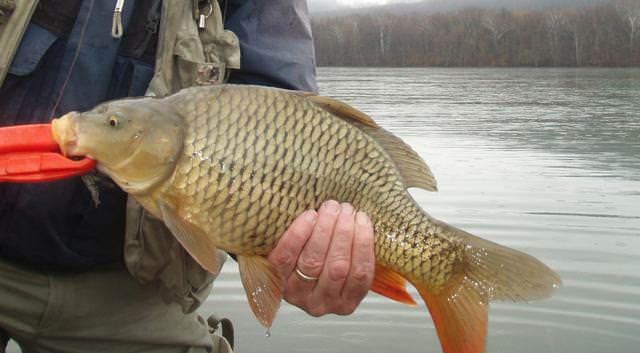 Most of the time, at 40 F or below, the pick up of the bait by the bass is barely noticeable. Sometimes only a small hesitation or twitch in the line. Sometimes I need to let the bait just sit there quietly for what seems like an eternity. When I start to move it, I feel the weight of the fish and never even felt the take of the bait. I saw a young man throwing a spinnerbait this week. 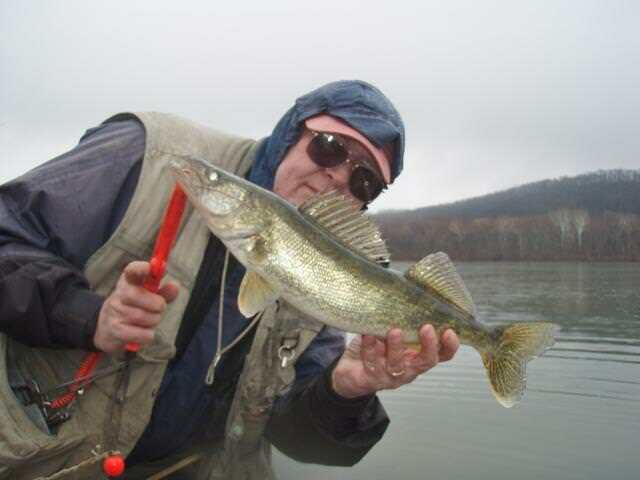 It may catch the occassional fish but most of them aren't gonna chase a spinnerbait in 40 degree water. Oh...but when we get consistently above 40F...can't wait. Thanks Bill! The description I was looking for. I also watch the Danville gauge for temps, since Harrisburg no longer posts water temps. Where on the Danville gauge do you guys see a water temperature? I cannot find it. Check the link I provided two posts earlier. The link will link you to the right NOAA website.